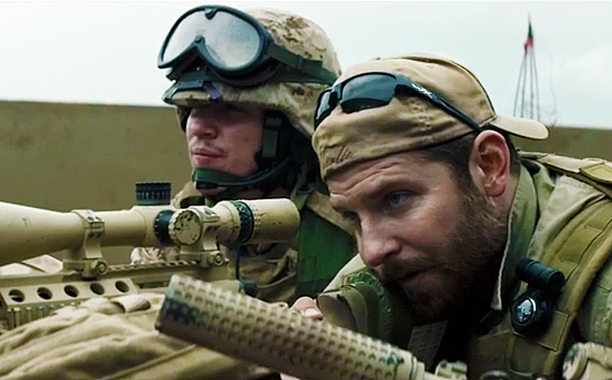 American Sniper (2015) – Hooray For Movies!! Synopsis: Navy SEAL sniper Chris Kyle’s pinpoint accuracy saves countless lives on the battlefield and turns him into a legend. Back home to his wife and kids after four tours of duty, however, Chris finds that it is the war he can’t leave behind. Chris Kyle (Bradley Cooper) holds the record for the most confirmed kills of any soldier in American history. It is, regardless of your political views or moral position, a fact. There is no grey in that fact, it is just a fact. Clint Eastwood’s biopic of Kyle’s life, set primarily over his several tours in Iraq, attempts to be almost as objective in it’s contextualising of that fact as the fact itself. In trying to play down the middle of the moral argument, portraying Kyle as a man bound by his extraordinary talent for long distance shooting and an ability to emotionally disengage himself for the most part to a role that few would have the stomach for, Eastwood leaves it to the viewer to paint Kyle as a hero or a villain. A man conflicted or destructively single minded. The motivations and actions of the marines engaged on the ground as disconcertingly dispassionate towards the locals they are trying to protect, or the actions of men trapped in extraordinarily difficult circumstances that is all to easy to pass judgement on if you’ve never experienced it first hand. It is to be expected then that leaving it open to such wide interpretation, the criticisms of glorifying war will face off against those who feel a patriotic or brotherly duty to defend Kyle’s actions and the deeper complexities of someone fulfilling the duties of their role for a greater purpose, regardless of the personal cost. It is not the first time this approach has drawn such divisive opinions in recent years. Zero Dark Thirty, which ranked as one of my favourite films about the war on terror, walked a similar middle ground, presenting the facts through a calculated and obsessively driven central character whose job becomes their reason for being above all else. In that review (here) we explored in more detail why the film was as divisive as it was, and much of that I feel applies to American Sniper. Although it is in the end a far more flawed and less well rounded experience than Kathryn Bigelow’s masterpiece. 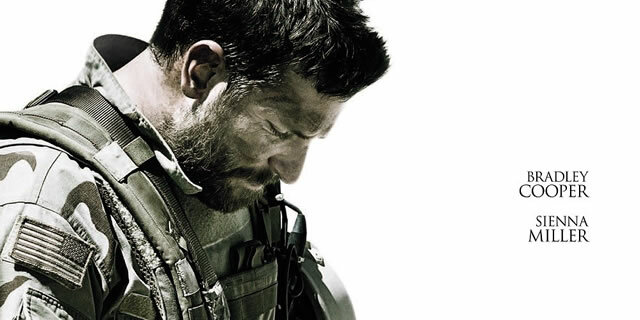 When it comes to American Sniper I will say that I have my opinions on the politics, but this is not a political blog and I do not feel strongly enough to allow my personal beliefs one way or the other to detract from the mechanics of the film, it’s ambitions, direction or performances. Bradley Cooper, who put on an impressive amount of bulk to match Kyle’s physique, plays the Texan marksman as a straightforward, emotionally introverted man’s man shaped by his father’s black and white view of the world. Early on Kyle is told under threat of a belting that the world is filled with sheep, wolves and sheep dogs. The Kyle men are sheep dogs, the protectors of those around them. It is a short scene and the only one that really speaks to how Kyle can so calmly and unemotionally act as the Angel of Death in the battlefield. The over-watcher of his brethren and often the only thing keeping them from an enemy combatant’s bullet. Eastwood ports the viewer through Kyle’s scope as he picks off threats with unemotional precision and reveals the paradox of the sniper’s role; the further you are physically from your target the more personal the act of killing, as their breath is taken from them with calculated intent rather than the adrenaline fueled instincts of close combat survival. 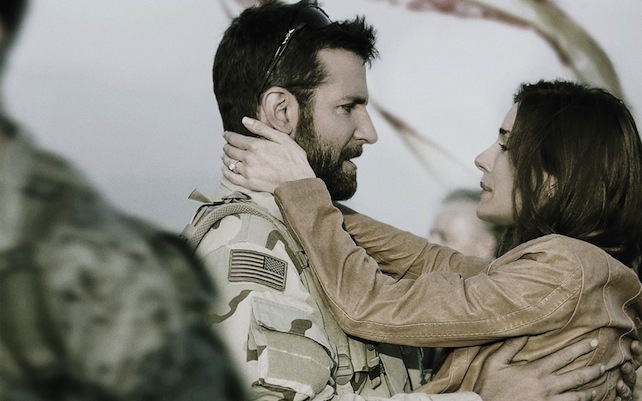 While this is very much Cooper’s film, the emotional counter-weight comes in the form of Sienna Miller’s performance as his doting wife and mother to his children, forced to deliver news of her pregnancy over a sat phone while hearing her husband pinned down by snipe fire in a war zone. With no matriarchal roles to speak of in the film she is the only female character to provide any balance to an otherwise testosterone fueled narrative. It is a role that could easily have been glossed over or short changed and it is another example, along with her brief turn in Foxcatcher and her performance as Tippi Hedren in The Girl, that Miller is shedding her previous It Girl image to carve out laudable performances. Where American Sniper has generated countless column inches discussing it’s politics, it has gained almost equal space dedicated to discussing it’s other key theme; Post Traumatic Stress Disorder (PTSD). Where Cooper portrays Kyle’s ability to emotionally disengage on the battlefield as a positive attribute, when he returns home those same traits take on a darker and more sinister context. The issue of soldiers adjusting to the day to day of suburban life after the trauma and adrenaline of war is well documented in recent years, and was dealt with particularly well in another Kathryn Bigelow film, The Hurt Locker. Again Eastwood appears to make every effort not to take an obvious stance on the matter but chooses to present the symptoms and their manifestations for the viewer to pass judgement on how much of Kyle’s actions are his and how much are as a result of his trauma. Eastwood’s design in presenting the facts to the audience are well intentioned but ultimately flawed in the execution. There is no doubting that the action sequences are tense, well constructed and solidly delivered. The moment, for instance, where Kyle has to make a decision on whether to shoot a young boy carrying a mortar towards his troop, which formed part of the trailer campaign, is a brilliantly paced and well acted sequence from start to finish. When we are taken to the quieter moments late on in the film where Kyle’s psychosis begins to overwhelm his home life, Eastwood and Cooper use a minimal amount of dialogue and time to drive home how difficult readjustment can be for troops. However while Eastwood might not have wanted to appear biased in his portrayal of Kyle and the American presence in Iraq, by virtue of telling the story of an American Sniper it was always destined to be heavily weighted in Kyle’s favour. It’s interesting to note that when Steven Spielberg was attached to direct he wanted to tell the story of Kyle’s obsession with tracking and killing an Iraqi sniper known as Mustafa from the perspective of both men who are, ultimately and objectively, executing the same duties from opposite sides. In Eastwood’s American Sniper though Mustafa is there purely as mechanical foil to justify Kyle’s self destructive need to kill his counterpart. Never do we hear him speak and only briefly are we given a glimpse of the fact that he has a wife and child also, who are probably equally as consumed by Mustafa’s drive as Kyle’s family are by his. Ultimately though Eastwood’s view of his subject and his foibles are almost as narrow as the view from Kyle’s scope that he spends so much time staring through. And while no one should forget the fact that for all of his flaws, which some psychiatrists I am sure would have a field day with deconstructing, Kyle was a man who selflessly put his life in danger without thought of the personal cost to fight for a cause he felt just, which should be neither underestimated or diminished. However, Eastwood’s decision to finish the film as he does arguably undermines any efforts to paint an objective portrayal of Kyle, his personality and the war. There is certainly no harm in ending the film the way he did, and many will consider it an apt and fitting tribute to the man. It does however make it very difficult to argue on behalf of Eastwood when he says his intentions are open to interpretation even if they are. Though there’s been plenty already said about it, it should be noted that this is still a very effective, hard-hitting movie about PTSD. Even if it isn’t perfect, to say the least. Good review.